At the Helper Appliance step of the wizard, click Finish to start restoring VM guest OS files. The file-level restore appliance may take about 10-40 seconds to boot. 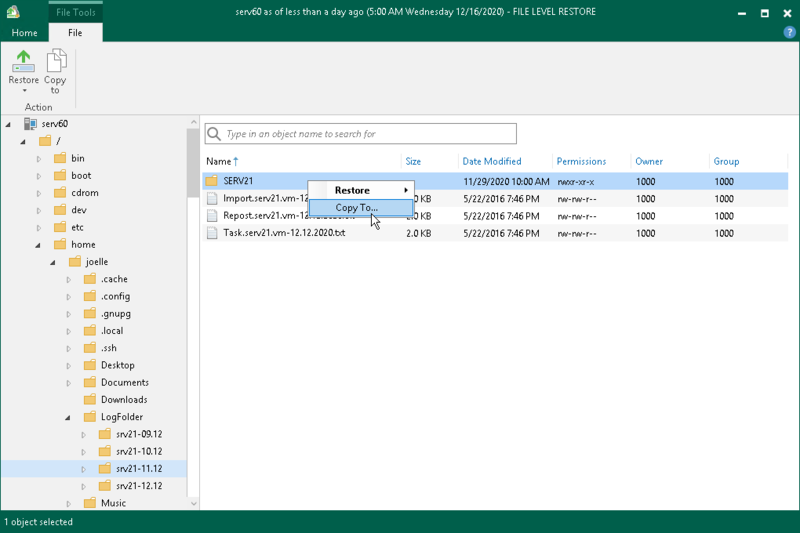 When the restore process is complete, Veeam Backup & Replication opens the Veeam Backup browser displaying the file system tree of the restored VM. You can restore files and folders to their original location, new location or access files on FTP. 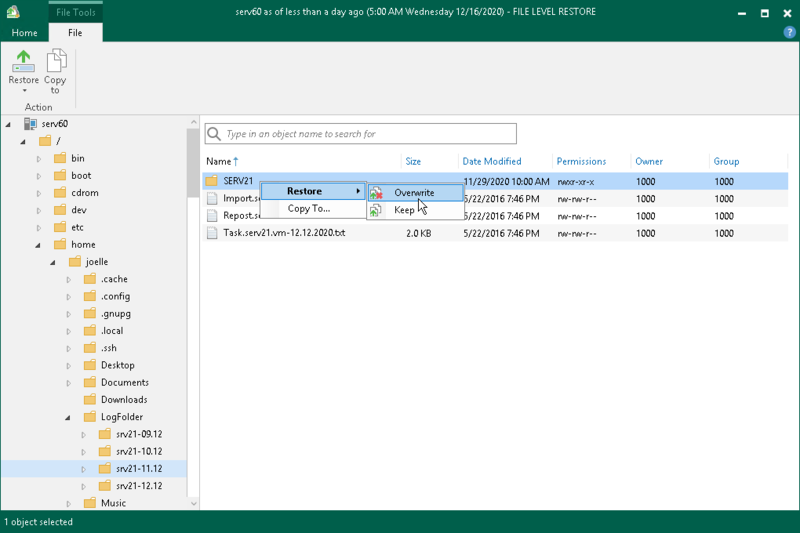 You can browse the VM guest OS files and access restored files on the FTP only while the Veeam Backup browser with the restored files is open. After the Veeam Backup browser is closed, Veeam Backup & Replication unmounts the VM disks from the helper appliance and removes helper appliance from the ESX(i) host. To save the file restored from the backup next to the original file, select Restore > Keep. Veeam Backup & Replication will add the .RESTORED-YYYYMMDDHHMMSS suffix to the original file name and store the restored file in the same folder where the original file resides. To restore files to the original location, Veeam Backup & Replication uses the account for VM guest OS access specified in the backup job settings. If this account does not have sufficient rights to access the target VM, you will be prompted to enter credentials. In the Credentials window, specify a user account to access the destination location (server or shared folder). In some cases, you may remove the original VM and restore it from the backup by the time of file-level restore. If you then attempt to restore VM guest OS files to the original location, Veeam Backup & Replication will not be able to find the original VM by its reference ID, and display a warning. Click OK and browse to the target VM in the virtual infrastructure to which you want to restore VM guest OS files. Right–click the necessary file or folder and select Copy to. In the Select Destination window, select the destination server (local or remote) from the list or provide a path to the shared folder. If you are recovering files to a Linux server, you can select the destination server from the list or add a destination server ad-hoc. To do this, scroll down the list of servers and choose Specify a different host at the end of the list. Follow the steps of the wizard to add a Linux server that will be used as a target host. The server you add ad-hoc will not appear in the list of managed hosts in Veeam Backup & Replication: its purpose is to host the files that you recover. It will only remain visible in the Veeam Backup browser until all currently active file-level restore sessions are completed. If you are recovering files to a shared folder, specify a path to the destination folder. If you want to preserve original permissions and ownership for recovered files, select the Preserve permissions and ownership check box. To restore original permissions and ownership settings, the user account you have specified must have privileges to change the owner on the selected server or shared folder. If you have chosen to enable FTP server on the FLR appliance, the restored file system will also be available over FTP at ftp://<FLR_appliance_IP_address>. Other users in the same network can access the FLR appliance to restore the files they need. Accessing the appliance over FTP requires credentials. Use the Guest OS helper appliance credentials specified in managed credentials. If the password has not been updated, refer to the following knowledge base article: https://www.veeam.com/kb1447.